Saint Martins procession, where children carry lanterns through the streets and sing songs, is something my German friend, Linda, loved from her childhood. So what else would she do when she had a child but to organise her very own lantern walk in June (November 11 is the official date, when Autumn finishes and everyone is settling in for the long winter). 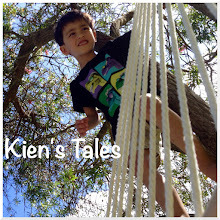 We joined them last year for the first time, and on Sunday Kien experienced his second lantern walk. We went over to their place so the kids could play for a bit before dinner. Then at 6pm there were lots of kids with lanterns at the park. We did a loop around the park in pitch blackness, the path lightened only by the lanterns (and a few torches here and there). It was nice to see such creativity in the lanterns people made. At the end of the walk we were all treated to some home-made German cookies. Kien conked out when we got home. It's a rare thing for us to stay home on a Tuesday morning, but I was expecting a couple of important deliveries, and although I could have rushed out for a bit we were actually rather happy to be inside where it was warm and cosy. Both Jef and I are a bit under the weather at the moment, and I'm heading toward a sick day in bed tomorrow judging by how I'm feeling right now. I've got a tonne of work to do which I cannot afford to neglect despite illness, so I've brought my laptop home and that will probably be my bed pal tomorrow. Hopefully that will see me right for tomorrow evening. We've got a sitter organised and Jef and I are going to a function that involves drinks, canapés, and a private screening of Prometheus in 3D. I will be well for it!